The partnership with LCR Honda was officially presented on 8 November in Bologna during the 43rd EIMA (International Agricultural and Gardening Machinery Exhibition). Paolo Bucchi and Lucio Cecchinello took part in the event, which was set up for the occasion at the Comet stand (Hall 30, BoothC3). 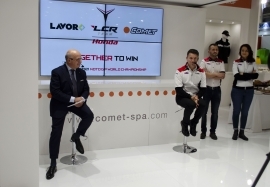 Lucio Cecchinello (LCR Honda Team Principal): “We are really happy with this new project and we are honoured for the trust that the Comet Group has placed in our team, as ambassadors of their colours and values in the world: attention to detail, technical expertise and passion for our work are just some of the aspects that unite us. In the next three years we will do our best to support all their promotional activities and we will be proud users of their products on the race track, trying to give useful advice for the development of a range of high-pressure cleaners designed specifically for cleaning motorcycles, meeting the needs of thousands of motorcyclists worldwide. The joint Comet/Lavor sponsorship has been planned according to a careful commercial strategy, with the aim of promoting the two brands worldwide while, at the same time, strengthening the identity of the Group on the main markets of reference.